Original Editors - Jill Heil & Jillian Redlinger from Bellarmine University's Pathophysiology of Complex Patient Problems project. Hemochromatosis, also known as bronze diabetes or iron storage disease, is an autosomal recessive hereditary disorder characterized by excessive iron absorption by the small intestines. Individuals with hemochromatosis lack an effective way to remove excess iron, and the iron begins to accumulate with subsequent development of fibrosis in the liver, pancreas, skin, heart, and other organs. Excess iron accumulation in the body promotes oxidation and causes tissue injury, fatigue, arthralgia or arthritis, and skin changes. Complications can include hepatomegaly, diabetes, impotence (males), pulmonary involvement, and cardiac myopathy. • In one of every 200-300 people there is a genetic abnormality found, but there can also be an excessive amount of iron intake that can cause Hemochromatosis. • Occurs 5-10 times more often in men than women; this is due to women losing blood through menstuation and pregnanacy. • Symptoms occur in men >50 years and are rarely symptomatic before 30 years of age. • Women experience symptoms around age 60. • It is the most common autosomal recessive disorder in people of Northern European descent  There are approximately 10% of Caucasions in Western countries who carry one gene for hemochromatosis. • If an individual has hemochromatosis, their brothers and sisters have a 1 in 4 chance (25%) of having two HFE gene mutations and their children have about a 1 in 20 chance (5%) of having two HFE gene mutations. Historically, hemochromatosis was identified by a classic clinical triad which includes an enlarged liver or hepatomegaly, skin hyperpigmentation (See Figure 1), and diabetes. However, hemochromatosis may have many different signs and symptoms, confusing early diagnosis. Early diagnosis is made difficult with no symptoms present in the early stages because it takes many years of iron accumulation to produce warning signs or symptoms. Figure 2. 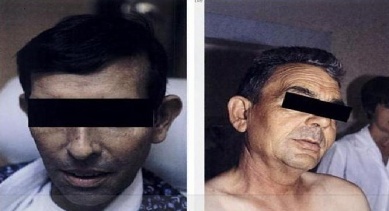 Hyperpigmentation in Hemochromatosis. A.) bluish-gray tint B.) bronze tint. Hyperpigmentation is caused by an increase in melanocytes and a thinning of the epidermis. Early symptoms promoting a visit to the physician include severe fatigue (74%), impotence (45%), and arthralgia (44%). Often times, when symptoms begin to appear, it is too late because iron accumulation has caused irreversible tissue or end-organ damage in the heart, liver, endocrine glands, skin, joints, bone, and pancreas. Hemochromatosis is the most common genetic disorder causing liver failure. Hemochromatosis also is associated with calcium pyrophosphate dihydrate (CPPD) deposition disease or the deposition of calcium salts in the cartilage of joints which presents as an acute inflammatory arthritis. Acute attacks of synovitis can occur, which may resemble a rheumatoid flare. The initial and most common joints involved include the second and third metacarpalphalengeal joints. A difference from rheumatoid arthritis though is that MCP flexion is not accompanied by ulnar deviation. The arthritis can also progress to larger joints such as the hips, knees, and shoulders. • Cirrhosis of the liver, liver cancer, and liver failure may take place from excess iron in the liver. Hepatomagaly is one of the most common physical signs in patients with this disease. In a young asymptomatic homozygote, hepatomagaly may not be present. • Cardiac Disease- If hemochromatosis is left untreated then it can lead to congestive heart failure and impotence. CHF is a relatively uncommon manifestation of C282Y hemochromatosis, but it is often the complaint in juvenile hemochromatosis that presents. • Pigmentation- A darker skin pigmentation is a feature which occurs later in hemochromatosis which does improve with iron depletion therapy. “Bronze diabetes” is the clinical syndrome and it is a very rare presentation for hemochromatosis. • Endocrine Problems- in the late stages of hemochromatosis, impotence is a common difficulty. The impotence is often related to testosterone atrophy. Parental testosterone therapy may be a helpful solution which may also benefit the osteoporosis that occurs as disease advances. • Thyroid and pituitary dysfunction have also been associated with hemochromatosis. Chelation Therapy is recommended for those patients unable to receive phlebotomy such as those with anemia or in patients where the procedure is poorly tolerated. These drugs inhibit the iron absorption and include Deferasirox, Deferoxamine, and Deferiprone. Deferasirox is an oral chelation agent, administered at 10-30 mg/kg. Adverse effects can include elevation of the creatinine level, skin exanthem, diarrhea, and visual and auditory disturbances. Deferoxamine is administered intravenously or subcutaneously at doses ranging from 25 to 40 mg/kg. Intravenous infusion is usually 8-10 hours in duration and is repeated 5 nights per week. Similar effects can be obtained with subcutaneous bolus injections administered twice daily. The main adverse effects are inflammatory reactions at the sites of injection, visual and auditory disturbances, bone growth disturbances, and allergic reactions, including anaphylaxis. Deferiprone is given orally in 3 divided doses of 75 mg/kg/d. Agranulocytosis, neutropenia, arthralgia, gastrointestinal reactions, and elevation of liver enzyme levels are the main adverse effects . • It is recommended by the American Association for the Study of Liver Diseases (AASLD) that high risk groups should be screened for hemochromatosis. High risk individuals include those having a history suggestive of organ involvement, a familial history or hereditary hemochromatosis, and an individual with biochemical or radiologic abnormalities suggesting the possibility of iron overload. The Center for Disease Control and Prevention (CDC) suggests an individual be screened for hemochromatosis when their history suggests iron overload, they have a family history, or are symptomatic. The blood test should be done on individuals with signs and symptoms of iron overload and on first-degree relatives of patients with hereditary hemochromatosis older than 20 years. It should be done after an overnight fast and the measurement of transferring saturation will tell if there is an iron overload. Measuring serum ferritin at the same time will increase the predictive accuracy for diagnosis of iron overload. • Organ abnormalities may be revealed from a CT (computerized topography) scan or from an MRI (magnetic resonance imaging), which may help determine the severity of the disorder. The cardinal defect in hemochromatosis is the lack of regulation of iron absorption but the exact mechanism is unknown. Mutations of hemochromatosis gene (HFE) have been identified to help in better defining the type of disease present. The two mutations in the HFE gene identified include C282Y, which comprises the substitution of tyrosine for cysteine at amino acid position 282. In the second, H63D, aspartic acid is substituted for histidine in position 63. C282Y homozygosity or compound heterozygosity C282Y/H63D is found in most patients with hereditary hemochromatosis The discovery of these mutations has altered the diagnostic approach to hereditary hemochromatosis. Genetic testing for HFE gene mutation is recommended for all first degree relatives of patients with hemochromatosis. The cause of the various organ failures that accompany hemochromatosis is due to the excess absorbion of iron in the intestinal tract, thus causing progressive tissue damage in parenchymal organs from iron retention. Excess iron is hazardous because it produces free radical formation. The presence of free iron in biologic systems can lead to the rapid formation of damaging reactive oxygen metabolites. These can produce impaired protein synthesis, impairment of cell integrity and cell proliferation, and can lead to cell injury and fibrosis. It is the most common presenting symptom in women with hemochromatosis. It mostly occurs with arthralgias of the metacarpophalangeal joints of the hands . Many times these individuals present with chronic, indolent pain and joint stiffness; bony enlargement; and minimal signs of inflammation . Nonspecific aches in the back and in larger joints are more difficult to decipher because there is a high prevalence of these symptoms in the general population. Some ways to treat the arthropathy of hemochromatosis would be anti-inflammatory drugs but this is non-specific to the joints. There are about 30% of patients with hemochromatosis arthritis who have CPPD crystals recovered from synovial fluid. Congestive Heart Failure is a relatively uncommon manifestation of hemochromatosis, but it sometimes occurs in the later stages. Excess iron in the liver may cause liver problems. The most important determinant of prognosis in hemochromatosis is the timing of diagnosis. The earlier the disease is detected the earlier treatment can be initiated and a decreased risk of hepatic fibrosis may be expected. A patient with hemochromotosis can expect to live a normal life if diagnosed early and if they maintain adequate iron levels. Therapeutic Phlebotomy: In order to reduce the amount of iron in the blood, therapeutic phlebotomy, also known as blood letting can be done until iron saturation is less than 50% and ferritin level becomes less than 50 ng/mL. Initially, one-half liter of blood is removed from the body each week until the body iron level is normal. This may require many months or even years to accomplish. After that, less frequent phlebotomy is needed to maintain normal iron levels (See Figure 2) . How often you need this procedure depends on symptoms, levels of hemoglobin and serum ferritin, and how much iron you take in your diet. Figure 2. Schematic of Phlebotomy Need. Chelation Therapy: In patients with hemochromatosis who have heart disease, anemia, or poor venous access, treatment with iron chelation agents is recommended over therapeutic phlebotomy. This medicine inhibits intestinal absorption of iron, chelators of iron, hepcidin, or ferroportin supplementation. Iron chelation agents include Deferasirox and Dendrimers (see medicine section). Surgical Intervention: In patients with end stage liver disease or severe arthroplasty, surgery may be necessary. When end-stage liver disease progresses despite iron-reduction therapy, liver transplantation is the only therapeutic option. Another indication for liver transplantation is the development of hepatocellular carcinoma. Mary K. Allen emphasizes the importance of recognizing and understanding early symptoms and management of a patient with hereditary hemochromatosis so therapists will consider the disorder as a differential diagnosis or co-morbidity which will affect the physical therapy treatment received. Many of the early symptoms which initiate a physician visit are arthralgia and fatigue. These complaints can mimic other conditions such as arthritis or fibromyalgia which can make diagnosis challenging. The case report included in the article explains how the medical management of hereditary hemochromatosis can limit a patient’s tolerance to exercise after trauma. A physical therapist may need to take on the responsibility to contact the managing hematologist about an injury when a patient initiates of therapy. When evaluating a patient with hereditary hemochromatosis, a PT should be aware of the insidious onset of fatigue and joint pain. Also note that hereditary hemochromatosis may be a differential diagnosis. The exercise tolerance needs to be monitored, and interventions may need to be changed to accommodate if there are symptoms of low serum iron levels, such as fatigue and shortness of breath. Cardiac changes may also present. Hereditary hemochromatosis may cause both systolic and diastolic dysfunction in patients. Once systolic dysfunction is documented, exercise capacity becomes compromised. There has been no data studying the exercise capacity in hereditary hemochromatosis during the asymptomatic stage of this disorder so it is assumed that the exercise capacity and activity available should be no different than that for the general population. The removal of iron through phlebotomy treatment for up to 5 years has shown no affect on exercise capacity with subjects who have hereditary hemochromatosis compared with control subjects. Patients with hereditary hemochromatosis are continually exposed to elevated levels of oxidative stress even as iron levels improve which affect aerobic exercise capacity through modulation of the left ventricular diastolic function. There is further studies which need to be done in this area but it is something to keep in mind when treating patients with hemochromatosis. Alcohol - accelerates the absorption of dietary iron. Alcoholism occurs in 40% of patients with hemochromatosis. Alcohol also, increases the risk of liver disease and so should be avoided completely if you have hemochromatosis and liver disease. Raw shellfish - can be contaminated with Vibrio yulnificus and can cause sepsis in patients with hemochromatosis. o These patients absorb an increased amount of iron. It may be to a point where they have clinical iron overload. Examples of these include the hereditary sideroblastic anemias, severe alpha and beta thalassemia, and the myelodysplastic syndrome variants such as refractory anemia with ringed sideroblasts (RARS). o Patients with chronic anemia can cause iron overload and these patients present with increased effective erythropoiesis and increased iron absorption. This could be from hereditary spherocytosis or acquired sideroblastic anemia. o Patients with beta thalassemia major, sickle cell anemia, refractory aplastic anemia, and myelodysplastic syndrome are those who have hypertransfusion. These patients could receive as much as 100 units of red blood cells which contain as much as 20-25g of iron. This amount of iron is similar to or more than the amount in many symptomatic patients with hereditary hemochromatosis . o This is primarily a skin and liver disease which occurs in familial and random forms. The cause of liver siderosis in sporadic porphyria cutanea tarda may be related to a mutation in the HFE gene in most patients, but it has not yet been established as the cause. o The physical and radiographic findings in any given joint affected by hemochromatosis arthritis may be very much alike those in OA. The difference is the distribution of joints affected assists in distinguishing the diseases. o One pattern that is different from OA is in hemochromatosis arthritis the MCP joints are affected as well as the PIP but sparing the DIP joints. o Differing between idiopathic CPPD disease and hemochromatosis could possibly be the most challenging differential diagnosis. The features of both diseases are similar such as chondrocalcinosis, radiographic appearance, and the distribution of the affected joints. Case study of a 69 y/o women with no family history of hemochromatosis, but signs and symptoms present. http://www.cdc.gov/ncbddd/hemochromatosis/training/case_studies/case_2/index.html. Case Study of a 36y/o man with no family history of hemochromatosis, but elevted serum ferritin levels found. http://www.cdc.gov/ncbddd/hemochromatosis/training/case_studies/case_5/index.html. ↑ 1.0 1.1 1.2 Goodman CC, Boissonnault WG, Fuller KS. Pathology: Implications for the Physical Therapist 2nd ed. Philadephia: Suanders, 2003. ↑ 2.00 2.01 2.02 2.03 2.04 2.05 2.06 2.07 2.08 2.09 2.10 2.11 Goodman CC, Snyder TK. Differential Diagnosis for Physical Therapists: Screening for Referral 4th ed. St. Louis: Saunders Elsevier, 2007. ↑ 3.0 3.1 3.2 3.3 3.4 3.5 3.6 3.7 Margolis, S. The Johns Hopkins Complete Guide to Symptoms and Remedies. New York: Tess Press, 2004. ↑ 4.0 4.1 Duchini A, Katz J. Medscape Reference: History and Physical Examination. http://emedicine.medscape.com/article/177216-clinical (accessed 29 March 2012). ↑ 5.0 5.1 5.2 5.3 5.4 Allen, MK. Hereditary Hemochromatosis: A Literature Review and Case Report. Physiotherapy Canada 2010; 62:276-284. ↑ Hemochromatosis (Iron Storage Disease). Information for Families. http://www.cdc.gov/ncbddd/hemochromatosis/families.html (accessed 29 March 2012). ↑ Barton JC, Edwards CQ, editors. Hemochromatosis: Genetics, Pathophysiology, diagnosis, and treatment. Cambridge: Cambridge University Press, 2000. ↑ 8.00 8.01 8.02 8.03 8.04 8.05 8.06 8.07 8.08 8.09 8.10 8.11 8.12 8.13 Hemochromatosis: Clinical Features of Hemochromatosis. http://www.medscape.com/viewarticle/421519_3 (accessed 29 March 2012). ↑ 10.0 10.1 10.2 10.3 Hemochromatosis Clinical Presentation. Presentation. http://emedicine.medscape.com/article/177216-clinical#a0256 (accessed 29 March 2012). ↑ Duchini A, Katz J. Medscape Reference: Background. http://emedicine.medscape.com/article/177216-overview (accessed 29 March 2012). ↑ Duchini A, Katz J. Medscape Reference: Pathophysiology. http://emedicine.medscape.com/article/177216-overview#a0104 (accessed 29 March 2012). ↑ 13.0 13.1 13.2 13.3 13.4 Stevens SM, Edwards CQ. Identifying and managing hemochromatosis Arthropathy: Nonspecific symptoms and overlapping conditions complicate the diagnosis. http://www.musculoskeletalnetwork.com/display/article/1145622/1391837 (accessed 29 March 2012). ↑ ChelationtherapyOnline. 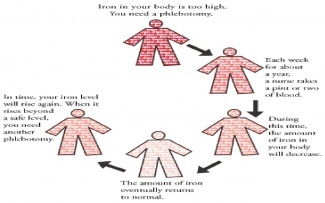 Iron overload and Hemochromatosis Information for Patients and Their Families. http://www.chelationtherapyonline.com/anatomy/p6.htm (assessed 29 March 2012). ↑ 17.0 17.1 Shizukuda Y, Smith KP, Tripodi DJ, Arena R, Yau Y, Bolan CD, Waclawiw MA, Leitman SF, Rosing DR. Changes in Exercise Capacity in Subjects with Cardiac Asymptomatic Hereditary Hemochromatosis During a Follow-Up After 5 yrs. American Journal of Physical Medicine Rehabilitation 2012;9: 1-7. ↑ Harms R. Lifestyle and home remedies. http://www.mayoclinic.com/health/hemochromatosis/DS00455/DSECTION=lifestyle-and-home-remedies (accessed 29 March 2012). ↑ 19.0 19.1 19.2 19.3 19.4 Duchini, A. Hemochromatosis Differential Diagnosis. Diagnostic Considerations. http://emedicine.medscape.com/article/177216-differential (accessed 29 March 2012). ↑ Allen MK. Hereditary Hemochromatosis: A Literature Review and Case Report. Physiother Can 2010; 62: 276-284. http://www.ncbi.nlm.nih.gov/pmc/articles/PMC2911836/ (accessed 29 March 2012).